The previous episode brought to you the story of Baba’s unique trip to Badrinath which left that ancient shrine completely recharged. And now, we trace how the Avatar began restoring faith in the Vedas through inspiring the pundits who felt hopelessness and despair in their encounter with corruption of the times. 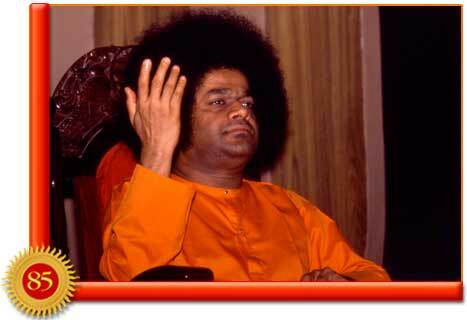 Way back in the 1940s, Baba had said that a part of his mission is veda poshana, vidwat rakshana and bhaktha rakshana, that is,fostering the Vedas, protecting the scholars and safeguarding the devotees. All these are part of Bhagavan’s principal mission of dharma sansthapana – the re-establishment of righteousness. Since that time, through several instances Swami emphasized in no unclear terms His objective of the restoration of ancient Vedic culture. One day in October 1955, a pious man rushed to Professor Kasturi gasping with joy. 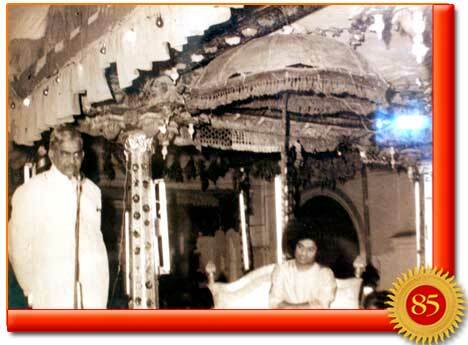 He said that once he had a large sum of money that Ramana Maharishi had told him to use for Vedic revival. He invested in some banks and trusts, but these failed to produce results. And now he had just come from Baba who said, "Do not worry. The task of Vedic revival is no longer yours. It is Mine." Two months later, the man died peacefully with the knowledge of this transfer of burden. In January 1960, a respected Sanskrit scholar from the Sorbonne (University of Paris) in France came to Prashanti Nilayam. During an interview one evening, he made a desperate plea to Baba saying that Vedic scholarship is fast declining in India. He asked Baba to revive and foster it. Indicating that Vedas are not for India alone, Baba, the Universal Teacher, said: "I have come for that very purpose, for Vedic revival. It shall be done. I will do it. Wherever you are, you will know of it. The world will share that joy, that light." The Vidwan Mahasabha (The Assembly of Pundits) was formally inaugurated during the Dussera Festival in 1965. About 200 pundits had arrived at Prashanti Nilayam for the concluding ceremonies. "Goddess Bhavani" said Baba, "handed a sword to Emperor Sivaji, and ordered him to venture forth to re-establish Dharma in his dominion.” Referring to himself, he continued: “Now this Siva-Sakthi is giving these pundits the sword of courage so that they will go forth to revive Dharma in the world. This Sabha will move forward from victory to victory, for it is contributory to My Work. "In all lands, the true sense of values is to be restored and faith in the Divinity of Man implanted. This is the work for which I have come. Humanity is to be saved from the consequences of limited knowledge and blinding pride. The world is a parched desert, calling out for rain. 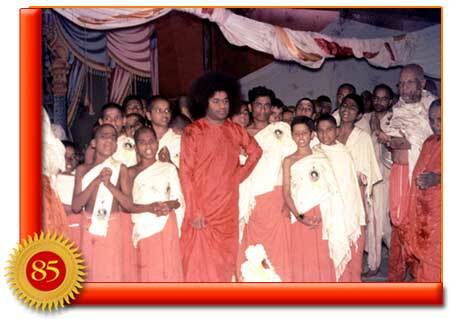 This Sabha will give each thirsty mouth a cup of solace and strength from the well of the Vedas and Sastras." Following the inauguration of the Vidwan Mahasabha, the pundits gave lectures on the Vedas and Vedanta. While presiding over these talks, Baba said there is a Vedic prayer, however indistinct, that arises in every human heart: "Thamaso maa jyothir gamaya - From darkness, lead me unto light. Eradicate Ajnana, the ignorance of the Universal, the Ocean of which the individual is but a wave. Light the lamp in village after village. Instill faith in man's freedom from grief and pain, that is to say, infuse faith in the Atma and the Atmathatwa, the principle of the Spirit. Share your learning and experience, in love and sympathy, with the people, those who are hungry to know and be saved. Remind them of their worth and work. You are not to condemn anyone's faith or to develop any new sect. Foster a positive attitude in spiritual effort. Baba said the pundits will sow in the cultivated hearts the seeds of the wisdom of the Vedas, of the three paths to the Divine - Karmakanda, the Upasanakanda, and the Jnanakanda of the Vedas, which are the path of action, devotion and wisdom. Baba said that the pundits must develop the art of explaining the scriptures to the masses in small easy doses. Unless the scholars practiced what they preached, their discourses would be exercises in hypocrisy. The people too need to be trained in the art of listening to short and straight spiritual discourses that kindle the desire to practice what is taught. Baba declared, "This Vidwan Mahasabha is not something new. It is ancient. It is part of the age-old Mission, the Dharmasthapana – establishment of righteousness done over and over again. You have now the chance to share in it. So, join this great task and make your lives worthwhile." That call was irresistible. Towns and villages vied with each other in asking for the chance to arrange meetings and seminars for the benefit of their citizens. 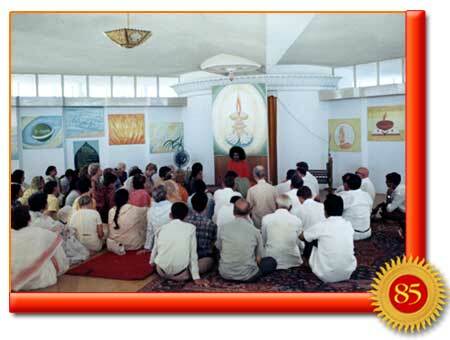 The first such conference was held in the presence of Baba on the grounds of the Royal Palace in Venkatagiri. The citizens of Rajahmundry were hoping the inaugural teaching would be in their town as the idea of the Sabha was resolved nearby on the banks of the Godavari a year earlier. Baba commented: "Like all good things, this too is won not so much by present effort, but by merit accumulated through years numbering to centuries. 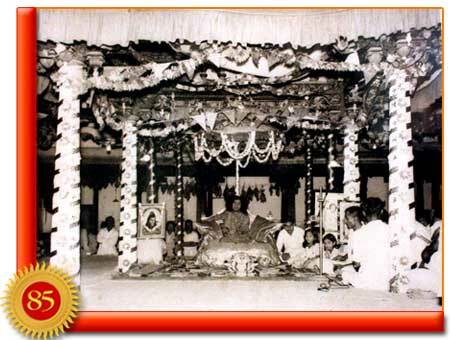 For hundreds of years the Royal Family of Venkatagiri has been dedicated to the support, protection and promotion of Dharma. Consider the number of temples built or renovated and maintained by the family’s munificence. Take count of the pundits it has patronised, and the number of religious books its donations have helped to reach the masses. Even now the family takes interest in the upkeep of temples and mutts throughout the State, despite the overwhelming storms of political change." In the years that followed, Vidwan Mahasabha was inaugurated to large gatherings in numerous cities and states, Bombay and Hyderabad, in Karnataka and Tamil Nadu. The Vidwan Mahasabha actively promoted lectures by pundits in several towns and villages. Thus, the universal values and disciplines of the Upanishads were planted among agricultural workers on coffee plantations and in the rice fields, among factory workers in the cities, among those living in bungalows in the suburbs, on university campuses, in pensioners' colonies, pilgrim centres and professional clubs. Where formerly the audience at the meetings addressed by these scholars could be counted on the fingers of one hand, and where in every place the same few were the only ones attracted, the meetings of the Mahasabha now drew tens of thousands in towns and all the population in the villages. For, the discourses were in the language of the people and were simple and useful, directly affecting the daily life. These were often presided over by Baba. His Divine Presence brought together hundreds of thousands to His Discourses, for they are the authentic Upadesh of the Lord. The purpose of bringing the Vedic truths into homes and hearts of common folks was to remind humanity that incorrectly man believes he is the sheath and not the sword, that he is the body and not its occupant. It is for the purpose of liberating man from this petty role that human beings have condemned themselves to that the divine has descended in human form. 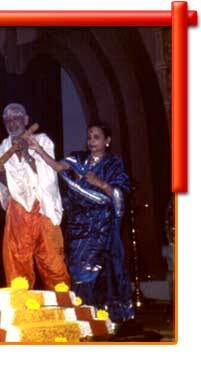 Baba has revealed that the repositories of ancient Indian culture are His instruments for this purpose. Baba presided over a vast gathering of admirers and students when the Hindu Samaj at Rajahmundry honoured three old and revered Masters of the Ancient Learning. 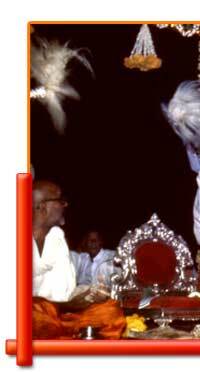 Later, during the Dussera Festival in 1965, Baba conferred upon the three the mark of appreciation that royal patrons used to confer in past ages, the "Suvarna Kankana" or gem-set golden bracelet. Everyone saw the love with which He helped the old men come on the stage, the pride which He seemed to take in their achievements, and the solicitude with which He helped the Governor to fit the jewels on the wrists of the recipients and cover their shoulders with the gold embroidered shawls – every person who has seen this will cherish that scene as a lovely expression of divine love and inspiration. 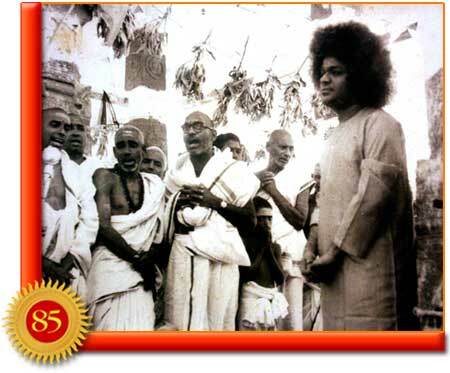 Pundits have good reason to welcome the Sathya Sai Era, for He is their Kalpatru (wish-fulfilling tree) come on earth. When a scholar read before Him some poems that he had composed about Goddess Kamakshi of Kanchipuram, Baba created a golden image of that Goddess and bestowed on him that precious gift. Baba is Vedamata, the Mother or the Source of the Vedas. He cannot tolerate a Vedic scholar toiling with the mark of agony on his brow, except when He is set on teaching a lesson. He is a hard task-master, intent on maintaining the moral standard of those who claim to be masters of the ancient scripture. A pundit from the East Godavari district was so desperate financially that in his despair he denied Baba's Grace. He refused his wife the permission to write to Baba asking for assistance in her time of difficulty. 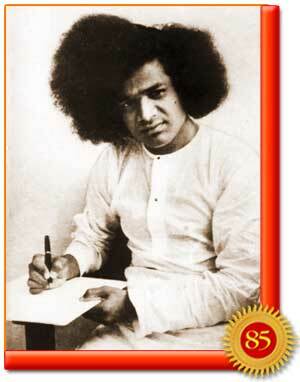 Two days later, he was amazed to receive a letter from Baba who was at Prasanthi Nilayam, 800 miles away. Baba severely reprimanded him: "Why did you tell her, 'You have no permission?” He wrote. “Do I not know? Can I know only when she writes or any one writes? Do I not know that you went to Ramachandrapuram expecting to collect some little money through discourses on the Gita and that you returned home having incurred loss? Am I not aware that you then started condemning yourself that all your learning was a waste; that all your experience was of no value. For Me who is providing for all this world, it is no burden to provide for you and your family. I am placing all these hardships on you only to teach you a few lessons." 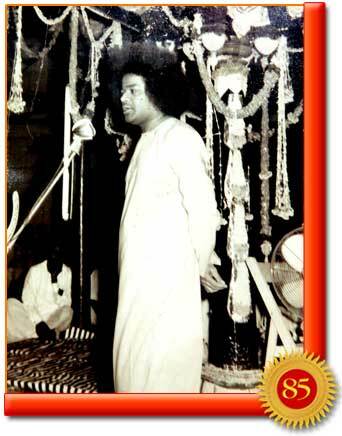 In the same letter, Baba indicated the lessons: "When life flows merrily on, people claim that it is due to their own effort and forget the Lord. When failure resists the flow, they start cursing and losing faith. When you grow desperate, you are insulting the Atmathatwa, the Atma principle which you really are, that knows no pain or joy. You have become educated in many subjects, but you do not try to derive the fruits thereof by putting them into practice. If you would have the faith that nothing can hinder the Atmananda, which is the live spring in every heart, how happy you would be. “In your lectures, you pontificate on the Atma and the Ananda derivable by man and drill deep down into it. It is easy to advise others. When it comes to practising what you recommend, you feel it an awful bother. "With all the knowledge of the Vedas, Sastras, and Puranas, stuffed in your brain, this wailing and anger does not become you. Resort to the Name of the Lord. That is the most effective remedy for anxiety. Why do you waste time recapitulating and lamenting over pain, fear, loss and grief? “Engage yourself in that which is enjoined as your duty which is demanded by your status. Do it courageously and gladly. Do not decry the rich, or for that matter, anyone in any manner. For remember, Sai is in every person. So when you decry another, you are decrying Sai Himself." What vigilant supervision of the workings of the inner consciousness of the pundits Baba undertakes! 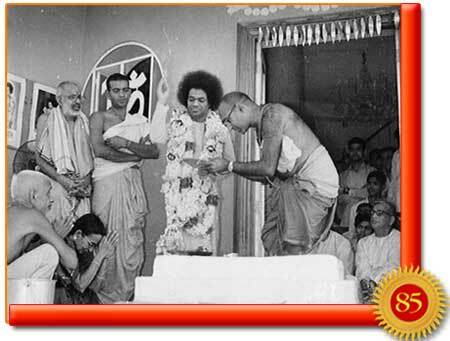 It is another of the many ways in which He seeks to promote Sanathana Dharma – the ancient spiritual heritage of mankind. Unless we have a brave band of Vedic scholars who live the Vedic life, the world cannot be enthused to honour and accept the Vedic teaching of Fundamental Oneness. Baba admonishes: “Cynics carp without knowledge. If they learn the Sastras or scriptures, or if they cultivate direct experience, they can understand Me. Your innate laziness prevents you from the spiritual exercises necessary to discover the nature of God. This laziness should go. It has to be driven out of man's nature in whatever shape it appears. That is my mission. My task is not merely to cure and console and remove individual misery but is something far more important. The removal of misery and distress is incidental to my mission. 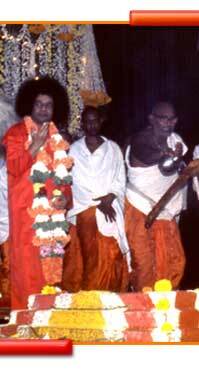 My main task is the re-establishment of the Vedas and Sastras and revealing the knowledge about them to all people. This task will succeed. It will not be limited. It will not be slowed down. When the Lord decides and wills, His divine will cannot be hindered.